Within one hour, it will be May - the start of the HOT election season. And yet, former MCEA President Bonnie Cullison, who is one of the county's top open seat Delegate contenders, still has a website that looks like this over six months after starting a campaign account and four months after purchasing an ad. This is unthinkable for a modern Montgomery County political campaign. On Thursday at 7:46 PM, Red Maryland broke the story that Carmen Amedori was leaving Brian Murphy's GOP gubernatorial ticket. Today at 10:42 AM, the Post reported the same thing with no credit to Red Maryland. This reminds your author of the massive Annapolis mayor race scandal first reported by blogger Paul Foer and then amplified by the mainstream media with no mention of him. This blog and many others constantly link to and credit the MSM for their work. 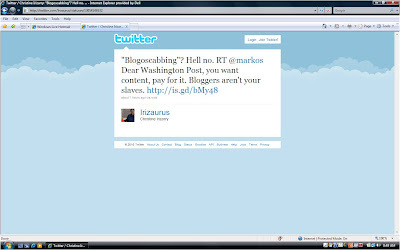 Some MSM sources, like NBC 4 and the Washington Business Journal, return the favor. Would it really kill the rest of them to do the same? In news we never believed we would report, fans of American Idol are driving additional traffic to MPW. Yes, dear readers, that is not a typo! Back in June 2008, we wrote a post called “Annapolis Fit Club” in which we noted the excessive eating habits of some members of the Maryland General Assembly and recommended that they attend weight loss bootcamp. 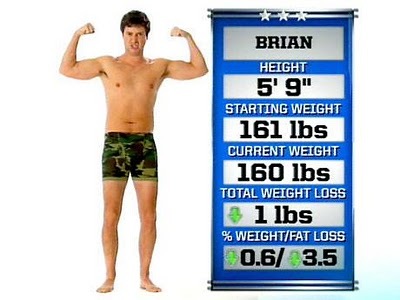 The post included this picture of former American Idol co-host Brian Dunkleman, who lost weight using such a procedure on the reality series Celebrity Fit Club. Well, it turns out that the search engine Bing.com lists that picture in its Brian Dunkleman image page and that anyone who clicks on it is sent to our Annapolis Fit Club post. Since this is the only image listed by Bing of Dunkleman in a bathing suit, that image – and our blog post – is getting a lot of clicks. 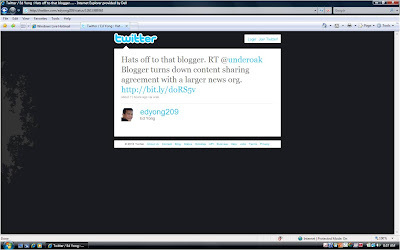 In fact, that two-year-old blog post could be one of our top ten posts this month. This is not unprecedented. Readers came out of the woodwork (and other crevices) to view our pieces on British Lucky Paul, and not necessarily because of their interest in Maryland politics. And this image of Miss California generated a TON of traffic to Inside Charm City last summer. 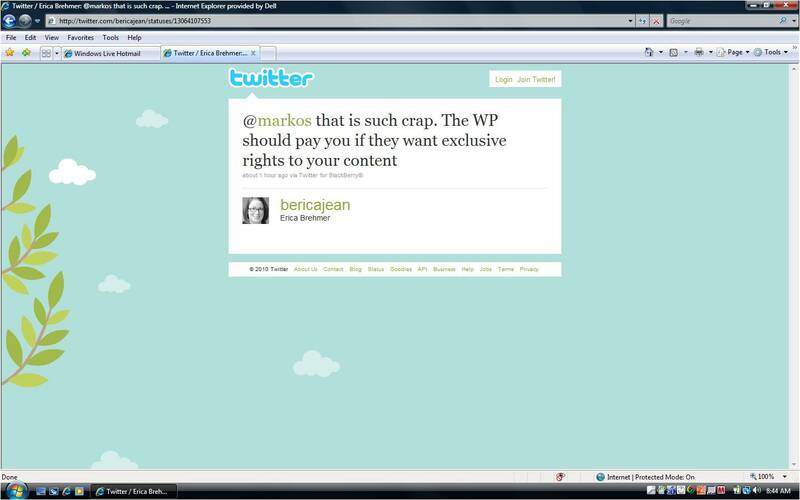 Such is life in the blogosphere. 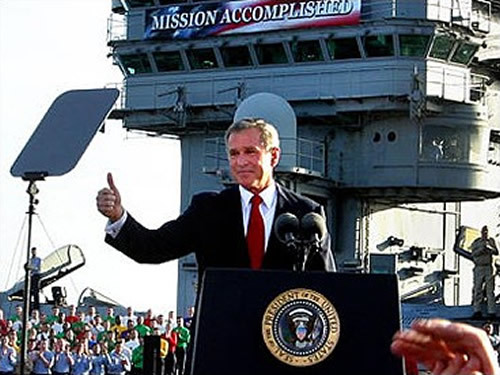 But if one – just one – crazed Brian Dunkleman stalker decides that he or she can’t live without Big Daddy, Robin Ficker or the incomparable Saqib Ali and becomes an educated consumer of Maryland politics, well – let’s just say, Mission Accomplished. Montgomery County Director of Economic Development Steve Silverman sent the following letter to members of the business community explaining Maryland's failure to land Northrop Grumman. I am sure that there will be many articles written about Northrop Grumman’s decision to locate in Virginia, and I also assume that the facts and speculations surrounding the deal will be rehashed and debated. Given my day-to-day involvement in the County’s efforts to secure Northrop Grumman, I wanted to provide you with my personal perspective on this effort. Rest assured that Montgomery County and the State of Maryland put forth an extremely competitive offer to Northrop Grumman. During this five month process, Maryland and the County worked collaboratively to attract this high profile prospect, and did so by involving high ranking leaders in our business and public sectors. There are two important factors I would like you to know about this particular recruitment. One is that all of the elected decision-makers, who were required to sign off on our offer, starting with County Executive Ike Leggett and the Governor, did so with a thorough acknowledgement that we needed to be extremely aggressive, and aggressive in an unprecedented fashion. The second point I would like to convey is that Maryland and the County were complimented by many involved in the selection process on our attractive offer and welcoming nature. It appears that we surprised the site selection community with our proactive competitiveness, and in the process, hopefully changed the perception that Maryland and Montgomery County are not always willing to be real players in such high-stake recruiting activities – because we were and will continue to be. At the end of the day, Northrop Grumman made a business decision involving real estate and unfortunately this time, that decision did not go our way. As we have previously noted, the glut of office space in Northern Virginia will remain a challenge for us, no matter what type of aggressive incentives we propose. While we are clearly disappointed, the County, the State and our respective economic development agencies are proud of our efforts. I would like to thank you and your colleagues for your support of our corporate recruitment activities and ask that you continue your efforts to make Montgomery County a great place to live, work, learn, and play. Former District 18 Delegate candidate Dan Farrington, whom we picked as the early favorite for the District 16 open Delegate seat, has dropped out. Following is his statement. I am writing to let you know that I have made the decision to not run for the open House of Delegates seat in District 16. I have spent considerable time over the last several weeks discussing the balance between public service and family life with trusted friends, including many elected officials. I have concluded that at this point in my life I would be unable to fully give myself to the responsibilities of the office without sacrificing some of the commitments I have made to my family. As strong as my desire to serve is, my commitment to my family is stronger. This has been a very difficult decision for me in part because of all of the encouragement I’ve received from so many of you. Thank you for your friendship and support. The Gazette is reporting that Comptroller Peter Franchot, Attorney General Doug Gansler and Congresswoman Donna Edwards are not endorsing District 19 Senator Mike Lenett in his race against challenger Roger Manno. Lenett had claimed their endorsements in a campaign press release. We also talked to representatives of Franchot, Gansler and Edwards and received the same response. Franchot's campaign told us, "Comptroller Franchot likes and respects both Senator Lenett and Delegate Manno both personally and professionally. He will be staying neutral in the District 19 Senate race." Gansler's campaign said he got along with both candidates and wanted to stay out of a Democratic primary. A source close to Edwards told us, "She is NOT endorsing Lenett. As a matter of fact, Lenett is so scared that he lied about the endorsement he is asking forgiveness by asking Donna not to say anything about his 'mistake' and that the whole thing be forgotten." We hear Edwards is FUMING. Could she be so mad that she might actually support Manno down the road instead? Lenett (D-Dist. 19) of Silver Spring said all three previously endorsed him before Manno decided to run and their respective decisions to withdraw them are reasonable. "I believe they have reviewed and revised their policies on endorsing candidates in a Democratic primary," he said. "It's my understanding that they would now like to stay out of those races. I don't want to put them in any difficult positions." This reminds your author of a mistake committed by District 17 Senator Jennie Forehand when she claimed the support of Senator Jamie Raskin and former Montgomery College President Charlene Nunley last summer. Raskin told us his name was added without his knowledge or consent and Nunley told us she was supporting Forehand's opponent, Cheryl Kagan. Endorsements are very sensitive things. If you are a candidate seeking to claim one, our suggestion is to get it in writing and confirm it if circumstances in the race change. Here are the Final Two! The second of the three delegate/senator challenges. Saqib Ali may have finally declared his intentions to run against Senator Nancy King, but his efforts to unseat her have been ongoing since she was appointed to the State Senate in 2007. He has been relentless in challenging her on the issues and a bit personally as well, criticizing her after she made her own negative comments about Ali in the Gazette. I would not put much stock in the poll Adam highlighted. One Montgomery County Delegate told me they thought the name ID of all the state legislators , including their own, was well under 10% in their districts. That means at this point, a poll does not mean much. The poll questions were also not released. Ali is a great politician and he beat an incumbent to get elected to the House in 2006. But unlike that race, he will likely have to do without the Apple Ballot and most other institutional support this go around. On the other hand, he will have his political skills and work ethic. I saw that work ethic in action at a recent event, as Ali mined the crowd for voters, giving them the "Johnson treatment," while King mostly chatted with elected officials. The incumbent needs to get her campaign going and should not take this Ali challenge lightly. She hoped against hope that Ali would not run, but now she needs to get serious. One advantage she will likely have is the full weight of Senate President Mike Miller, and all the resources he possesses, to beat back Ali. That cannot win the race for her, but it will help. Saqib Ali is a blogger’s best friend. He creates lots of things to write about, drives tons of traffic to this site and others and is NEVER, EVER boring. And now he is giving us the best present of all: a hell of a Senate race. Thanks, Saqib! Unlike Lenett-Manno, this is a race of polar opposites. Ali is an enormously talented candidate who has mastered cyber-campaigning. He is progressive, charismatic and has a group of young volunteers who will run through walls for him. He also has tons of money. Ali is detested by the Annapolis establishment (which may help him) and his repeated public goading of King has turned off some party activists in his district. He is unlikely to get institutional support but won’t need it to run a high-quality campaign. Nancy King is a steady Eddie who has patiently climbed up the ranks from the School Board. She is a moderate, friendly woman who is utterly without pretense and plays well in one-on-one contact with voters. She will have plenty of money, plenty of endorsements and will benefit from the support of the district’s Delegates. If Ali thinks King will react to his challenge with the hysterics of Ida Ruben or the inactivity of Jennie Forehand, he is mistaken. King is smart and shrewd and knows the district well. This will be a superb contest for voters and MPW readers alike. This race is actually getting a little boring because Cheryl Kagan has been doing the same thing the entire time: working hard, knocking on doors, meeting with people, and raising money. 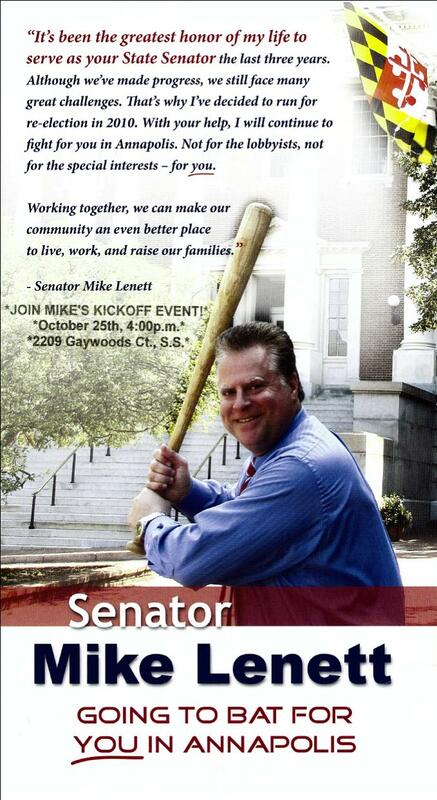 Of all the State Senate challenges, this looks to me like the most likely win for a challenger. As I have said before, the incumbent and Kagan seem to be running different races. Some key questions will be how much energy the District 17 slate and the Senate leadership put into this race. Forehand will need a big showing from both to withstand Kagan’s onslaught. Cheryl Kagan is the county’s best challenger. Jennie Forehand is the county’s most complacent incumbent. Kagan never stops campaigning and Forehand has never really started. The lack of a Delegate challenger means that incumbent Delegates Kumar “Bad Boy” Barve, Luiz Simmons and Jim Gilchrist are likely to spend the summer lounging at the beach rather than passing out slate literature at the doors. Forehand will get the Apple Ballot, but unless she starts running a serious race, it may not matter much. If I don’t see more fight from the incumbent, I am going to demote this contest in our next review. 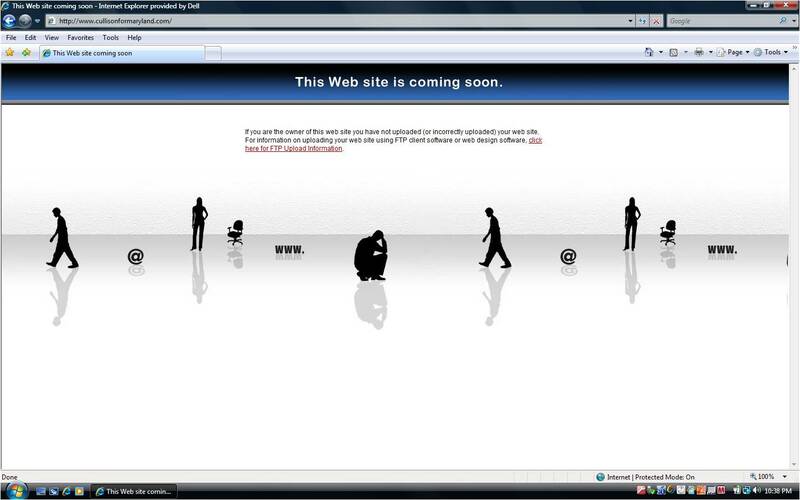 Delegate Saqib Ali (D-39) posted a series of videos on his website. This one from last August offers the most political and issue content. The six capital projects for non-profit agencies recommended for funding by the County Executive in FY11 are worthy projects that will enhance the quality of life for Montgomery County residents for many years to come. Each one of them will leverage the County contribution many times over by bringing in hundreds of thousands of dollars in State and private matching funds. The County has wisely and effectively used the model of cost sharing for capital projects for many years. Typically, a community service project operated by County government or a non profit community service agency will construct a strategic fund raising plan that is comprised of State funds, County funds, private funds, and, in some cases, as with Glen Echo Park, there will also be a federal role. Most projects therefore go through the rigors of review by several funding partners. There will always be debate regarding the relative value of a project, but the County has been helping non-profit partners with capital needs for years. One relevant fact is that these projects would be bond-funded in the capital budget. Hence there is no competition with expenditures either made or not made in the operating budget. CHI Centers, Inc is a forty year old non profit organization serving people with Developmental Disabilities. It operates within a County-owned former public school which badly needs renovation and repair. More than 90 percent of the people served are funded by the State and county government. The State has provided $600,000 with a required match. The Executive is recommending the County assist with the match by providing $200,000. The private supporters of CHI, Inc. will raise the rest of the money. The Ivymount School has been educating Montgomery County Public School referred children with Autism and other severe disabilities for nearly forty years in a closed County-owned school building. Also in the building is the Beverly Farms Child Care Center which provides child care for some Ivymount and many neighborhood children. The demand for the Ivymount School services is increasing and a renovation is needed to allow it to expand while maintaining the child care space. The State has provided $175,000 to help with the one million dollar plus costs and the CE is recommending $100,000 to help match the State funds. The Ivymount School is raising the other funds. The Girl Scouts of the National Capital Area are developing a camp in the Burtonsville area of the County to serve thousands of girls. The State has awarded the Girl Scouts $140,000 to build facilities at their camp. These funds require a local match. The CE has recommended $100,000 to match the State funds to enhance the camp. Some may argue that supporting the Girl Scouts Camp is not important. The Girl Scouts play an important role in youth development, especially among low income youth. The Jewish Foundation for Group Homes is a long-time partner of the County in working on transitional programs for individuals with developmental disabilities. The County would contribute $50,000 toward a project of repairs, renovations, and equipment purchases. The Olney Theater and the Arts Facility CIP are designed to support important capital needs in the arts in the County. The purpose behind the Arts Facility CIP is to set-aside $1.5 million a year for grants to County arts institutions’ capital needs. Far from being a “slush fund”, the County Council makes the final decision. This year, the County Executive has recommended $600,000 to match an identical State amount to get the ball rolling on the renovation of the Old Blair Auditorium and $500,000 for Olney Theatre. The Council will decide whether or not to accept those recommendations. By the way, contrary to the blog entry, there is no money for police helicopters or their pilots in the budget. The supposed MCGEO “study” on management salaries is totally discredited. And the Costco project (supported by the County Executive and a majority of the Council) is projected for 2012 – and so has nothing to do with this budget year. Our analysis clearly demonstrates that it would enhance our tax base, create hundreds of jobs, and help in the revitalization of Wheaton. Patrick Lacefield is the Director of the Office of Public Information. Following is a letter sent to the Gazette by Walt Bader, Executive Director of the Fraternal Order of Police Lodge 35, concerning a recent article published by the newspaper on the budget and a reader's response to it. When the Gazette addresses this, we will link to their comment. The Story: The March story claimed that "[s]ome Montgomery County union leaders are lashing out at County Executive Isiah Leggett (D) because his $4.3 billion budget proposal for fiscal 2011 includes layoffs, furloughs and wage freezes." In the following paragraph, it was reported that I "say Leggett illegally denied police officers the pay raises they were to receive in their negotiated contracts." "'He's required to put in what's in the contract,' Bader said of Leggett. 'He's required to do that. If he doesn't then he is in violation of the law.'" The Facts: I never spoke with any Gazette reporter about Leggett‟s actual budget. All of my comments were made on March 12 – three days before the budget was released and more than three days before I first saw the budget. The story certainly misleads a reasonable reader to believe that my comments were made after release of the recommended budget. I did not lash out at anyone or anything. While the Gazette does not specifically say that I did, Mr. Stierle drew that conclusion and premised most of his letter on the apparent mistaken belief that I had responded to Leggett‟s budget. The conversation with the reporter was about the law and an arbitration award. There was never a discussion about what Leggett did or did not do. 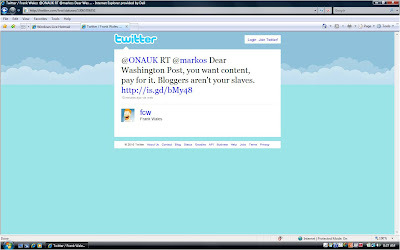 In a March 12 follow-up e-mail to your reporter, transmitting a copy of the actual arbitration award, I wrote: "Since I haven't seen the county executive's recommended budget, my comments are conditional, hence my use of 'if,' 'could,' 'potentially,' etc"
I further wrote, "By law, the county is required to include the arbitrator's award in his recommended budget. By law, the county executive may not directly or indirectly oppose appropriation of funds in a collective bargaining agreement." Moreover, I sent to your reporter a chart showing that about $700,000 was spent by the county on tuition that was not authorized under our contract. Significantly, both the arbitration award and my e-mail to your reporter point out that the FOP proposed giving up a scheduled 4.25% pay increase for the second consecutive year. 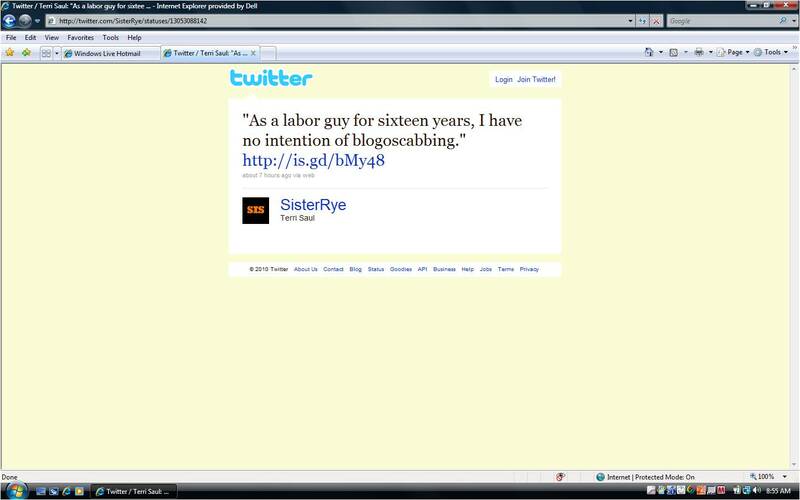 Had that been reported, perhaps Mr. Stierle would have known that we made significant concessions. This is not responsible journalism. Thurs, April 29th, at 9:00 p.m.
Tuesday, May 4th, at 9:30 p.m. Political Pulse is on Montgomery Municipal Cable in Montgomery County, MD. 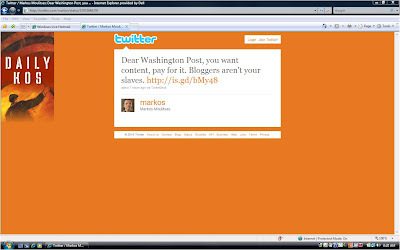 Egged on by Daily Kos founder Markos Moulitsas and film critic Roger Ebert, thousands of Twitterers are pouring in to MPW to read our rejection of the Washington Post's "offer" to work for them for free. As a result, MPW has earned more site traffic by turning down the Post than we would have ever gained through blogoscabbing. Twitter had simmered a bit over our decision to stay out, but it was relatively low grade until yesterday. 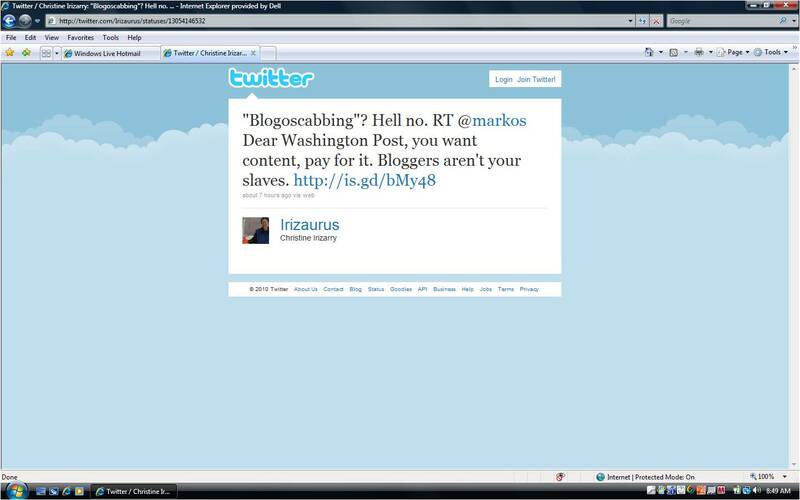 Then Markos Moulitsas, who has nearly 18,000 Twitter followers, got involved. Last night, he wrote, "Dear Washington Post, you want content, pay for it. 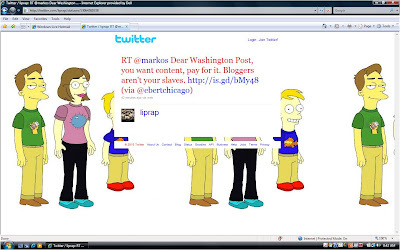 Bloggers aren't your slaves. 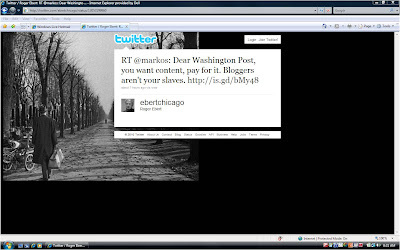 http://is.gd/bMy48" The link steered followers to our blog post. 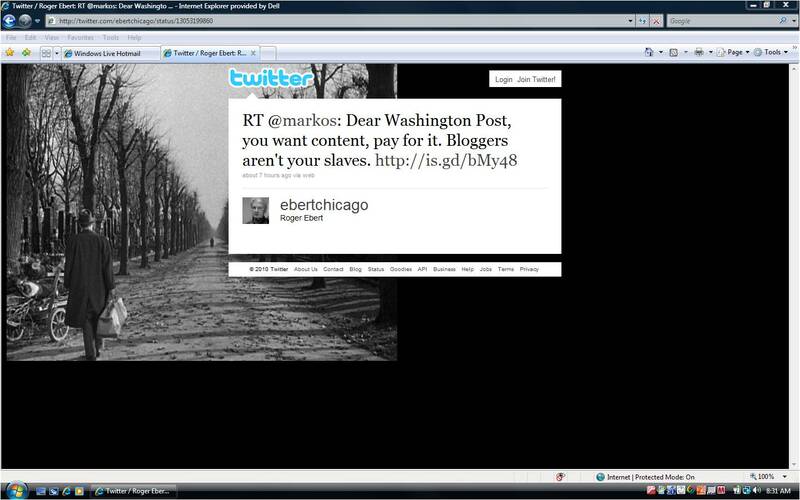 Roger Ebert, who has more than 137,000 Twitter followers, picked up on it. 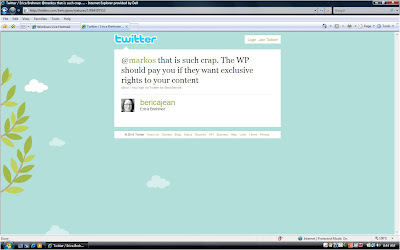 Together, Moulitsas and Ebert spawned huge numbers of copycat Twitterers, all of whom linked to MPW. There are too many to count, but here is a sample. 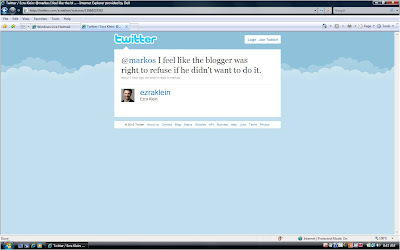 Even Ezra Klein, a paid Post commentator, said MPW was right to turn them down! Twitter's outrage against the Post will make this by far the most-visited day in the history of Maryland Politics Watch. 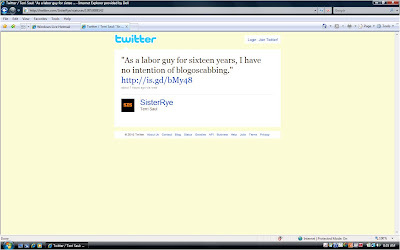 Let that serve as a lesson for independent bloggers everywhere: a little self-respect can go a long, LONG way. District 17 Senate challenger Cheryl Kagan has announced that she has hired a campaign staffer. Following is her press release. 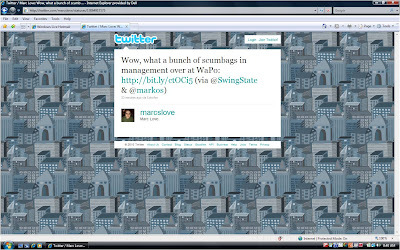 (Rockville MD, April 29, 2010) Former Delegate Cheryl Kagan today announced the hiring of an aide for her State Senate campaign, William Rice. Will Rice is a Montgomery County native who had a precocious interest in politics: he was probably the only 11-year-old celebrating in front of the White House the night President Nixon resigned. Most recently, he’s been working for progressive candidates and causes in Eastern Maine. He was a member of his county and state Democratic committees; on the executive committee of the county Democratic Party; and secretary of an area labor rights organization. In 2008, he managed the campaign of a candidate for the state legislature. In 2009, Will was a regional field organizer for a non-profit advocacy group working to pass federal health care reform. He consistently led the state in holding community meetings, promoting citizen communication with elected officials, and generating letters to the editor. Since moving back to the DC-area, Will has been working with the long-established liberal advocacy group Americans for Democratic Action. 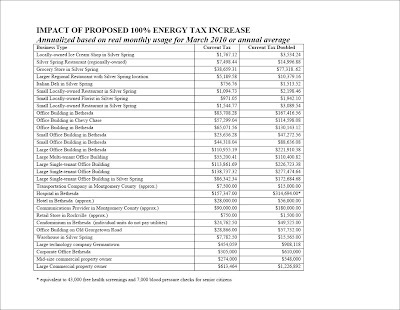 Thirteen business organizations have sent a joint letter to the County Council protesting the County Executive's proposal to double the energy tax. They have attached some truly eye-popping numbers on what the tax would cost MoCo businesses. Following is the letter and the data supplement. As organizations representing more than 5,000 businesses throughout Montgomery County, together we are writing to you to express our deep concerns regarding County Executive Leggett’s proposed energy tax increase. 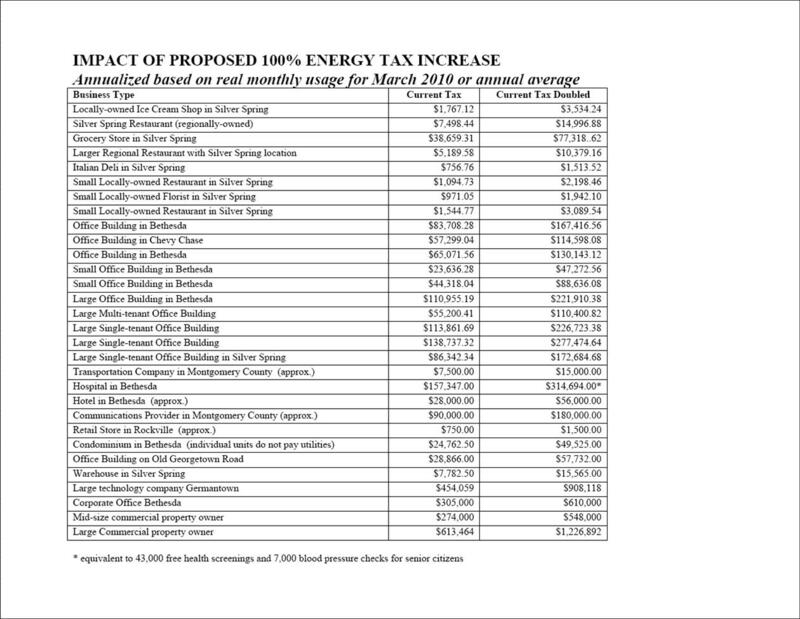 As you face what are some very difficult budget decisions this year, we would like to make you aware of what some of the negative impacts will be on job retention and creation if you choose to enact the 100 percent increase in the energy tax proposed by the County Executive. We believe that this approach, while filling a short term budget gap, ignores what are some serious long term implications of the action. Many of our business members have worked very hard over the past few years to reduce their energy consumption levels in order to reduce energy costs and preserve jobs. The 100 percent increase not only wipes away these cost savings that have been achieved but places yet an additional burden on businesses, small and large, that they simply cannot afford. Our commercial property owners tell us that their delinquency rates from small local and regional retailers are higher than ever, and every day landlords in Montgomery County are working on rent relief agreements in order to keep these businesses in their current locations. Many of these businesses, because of various constraints, simply cannot pass this cost on to their customers. In addition to the impact on current small business owners, the increase runs totally contrary to Montgomery County’s economic development strategy. Montgomery County’s focus on high technology and biotechnology will be undermined by tax increases to some of these companies of over $500,000 annually. These companies have indicated to us that the size and scope of this increase means that engineers, nurses, and many other skilled workers will not be hired because of the increased costs of doing business here in the County. While many have applauded the idea that this tax hits our federal government facilities, it seems an inopportune time to place a burden on these federal facilities while we are in a difficult competition to keep the Department of Health and Human Services in Montgomery County. In the next 3 years, 60 out of 90 federal agency leases in Montgomery County will be up for renewal. We need to be in a strong position to compete with the District of Columbia, Prince George’s County, and Northern Virginia to retain these tenants. We believe that this is the right time for County government to reexamine its priorities, focus on essential government services and take a serious look at government consolidation in order to eliminate duplication of services and achieve savings. The only way to have a sustainable future for Montgomery County is to be competitive with our regional neighbors and grow our tax base through the attraction and retention of jobs. This tax increase significantly undermines the County’s ability to achieve this objective. Clearly weary of needling from Delegate Saqib Ali on the subject of debates, Senator Nancy King has responded that she will meet the challenger on her terms. And of course, Ali had something to say about that. Hide the children and enjoy the entertainment, folks! Yesterday, King sent the following letter to Ali. 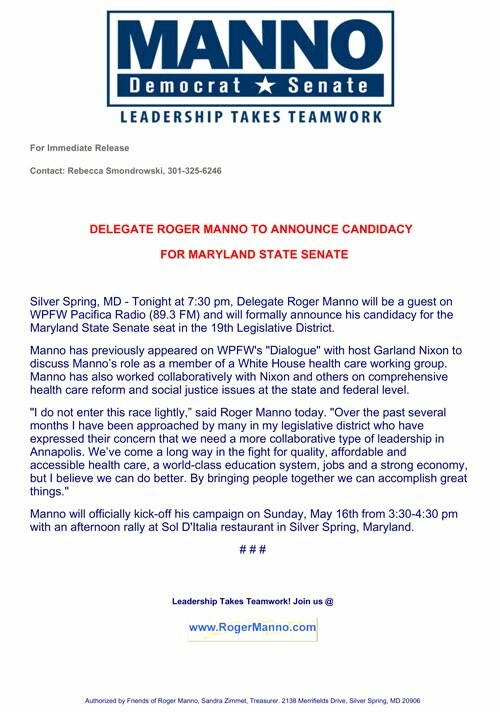 Several friends of mine forwarded your press release “challenging” me to debate – your first such challenge since announcing your intention to enter the race to represent District 39 in the Maryland Senate. After receiving their emails, I checked my voicemail, my email and my snail mail. 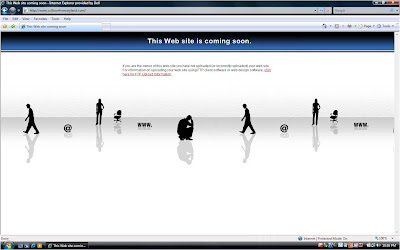 I did not find a message from you anywhere. Sending a press release in place of direct contact might be the style of Washington politics, but it’s not how our constituents expect us to treat each other. In fact, the people we serve are tired of politicians who go for cheap points in the press, but deny each other basic courtesy when no one is watching. I welcome the chance to debate. I am proud of my lifelong service to our community and my track record of championing our public schools and protecting our community’s families. I look forward to the opportunity to confront your repeated distortions of my record in open public forums. Your press release was not specific about your challenge, so I am offering my own. In addition to the candidate forums hosted by community organizations in our district, let’s hold three debates this summer – one in June, one in July and one in August. Each debate will be hosted by a neutral moderator and will be open to the general public. I hope you will give me the courtesy of a direct response, either by phone, email or snail mail. 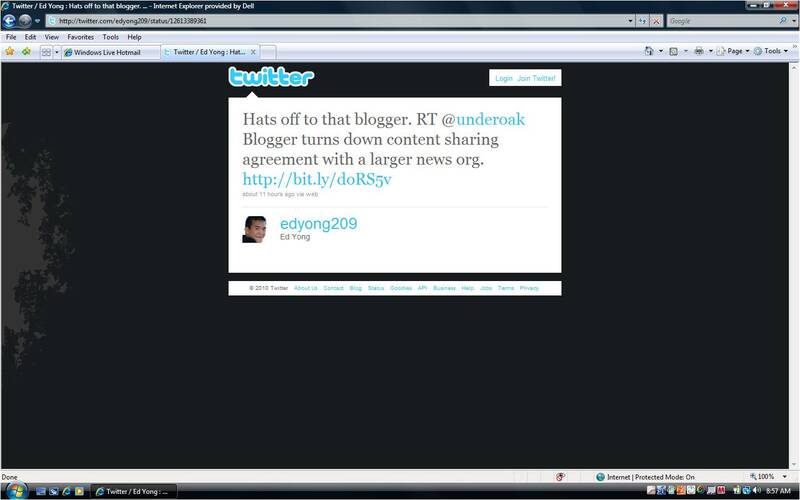 If you prefer to respond by press release, I hope you will give me the courtesy of adding me to your distribution list. Thank you for your prompt response to my debate request. I am glad that you are willing to join me in discussing the issues that most affect our constituents in District 39. As you know, I have said many times that I have great personal respect for you and hold you in the highest regard. However, I will take strong exception to any accusation that I have distorted your positions. Every statement that I have made about your record has been strictly based on publicly-verifiable votes you have cast and public statements you have made. These are clear matters of public record and I stand by my words. Such an accusation of distortion rings hollow without citing any specific statement. I urge you to provide such a citation if you can find one. Frankly, I was a bit surprised to see your letter insinuating that I was going for "cheap political points in the press." I have never leveled a single personal attack against you but instead have steadfastly argued only about substantial policy issues. I pledge to continue to do so throughout the entirety of this campaign. Debate and criticism of our legislative records is certainly fair game. On the other hand, you have publicly called me "crazed" and "desperate" in the newspapers and even made false ethics allegations against me. For this reason your complaint would seem to be devoid of any credibility. In addition to the three debates that you recommended, I insist that we also hold one joint appearance on a radio or television broadcast for those constituents who cannot attend the public forums. I know that Mr. Charles Duffy often hosts such debates on the television show “Political Pulse” on Comcast. I am confident that he would invite us to make a joint appearance on his show. Otherwise, Kojo Nnamdi seemed open to us making a joint appearance on his radio show on WAMU. Our campaigns can coordinate to arrange the logistics surrounding all four events. As you mentioned in your letter, we should take extra care to ensure that the moderator is unbiased. Here are races Four and Three! In 2006 there were thirteen candidates for County Council at-large, three of them incumbents. So far, there are just seven candidates with four of them incumbents. Since we last wrote, Hans Riemer has entered the race and, I would argue, been the dominant challenger. He has been picking up lots of endorsements, holding events around the County, and creating lots of buzz. But Becky Wagner is still a potentially potent force despite her lackluster fundraising. Having Doug Duncan actively supporting her could be an influential endorsement. Jane de Winter also continues to make the rounds around the County. This race is about volunteers and mail because no individual can knock on the doors countywide. Full disclosure, I am a public supporter of Hans Riemer and donated to him. Let’s start with the incumbents. Nancy Floreen and George Leventhal are coming back. Both are proven vote-getters with plenty of money and almost certain access to the Apple Ballot. 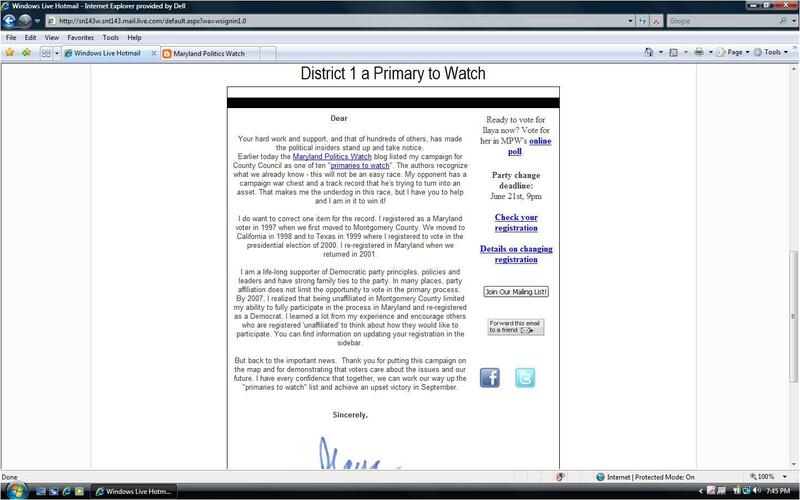 Marc Elrich has little money, good grass-roots support, union backing and probably no Post endorsement. Duchy Trachtenberg has LOTS of money, no grass-roots support, no union backing and will probably get a Post endorsement. I would take Elrich’s mix of strengths and weaknesses over Trachtenberg’s, but reasonable people could disagree. The next big hurdle in this race is which challenger gets on the Apple Ballot along with Floreen, Leventhal and Elrich. Riemer is running the best campaign at the moment, but Wagner is a better public speaker and has a much longer track record of activity inside the county. Jane de Winter is probably not doing enough to match them. Whoever impresses the teachers as the most viable candidate will get the Apple and be in position to grab a seat in September. Roger Manno and Mike Lenett have a personality clash that has exploded into a political one with Manno challenging Lenett. Both are hard working and have the ability to self-fund to some extent, so this race should be a political battle royale. The question for Manno is how does he convince many of his supporters, who also voted for or supported Lenett in 2006, to turn on the incumbent? Most special interest groups and voters tend to stick with incumbents unless they have a real good reason not to. What good reason is Manno offering? This is one of three districts where a sitting Delegate is challenging a sitting Senator of their own party. Although this seems like a natural enough move, the last time anyone I spoke to recalled it occurring was when District 18 Delegate Chris Van Hollen defeated incumbent Senator Patricia Sher in 1994. Senator Mike Lenett is a white, forty-something lawyer from New York who has worked on the Hill and has been a down-the-line progressive. Delegate Roger Manno is a white, forty-something lawyer from New York who has worked on the Hill and has been a down-the-line progressive. What a choice for the voters! This will be a GREAT race between two top-tier candidates, but each has a message problem. Lenett is accusing Manno of disloyalty to the party because he is challenging a sitting Democratic Senator, but Lenett did the same thing four years ago. Manno needs to explain why he is running against an opponent whose issue and voting record is nearly identical to his own. This could easily mutate into one of the nastiest contests the county has seen since, well, 2006. We’ll have the Final Two tomorrow. Governor Martin O'Malley has issued the following statement of support for the District 18 Democratic Team, which includes Senator Rich Madaleno and Delegates Ana Sol Gutierrez, Jeff Waldstreicher and Al Carr. President Obama showed us that when Democrats stick together, we can accomplish incredible things. The District 18 Democratic Team has shown the ability to work together in Annapolis to create economic opportunity, promote public schools, fight for social justice and maintain Montgomery's quality of life. That is why I endorse Senator Madaleno and Delegates Carr, Gutierrez and Waldstreicher: the District 18 Democratic Team. Together, we are moving Maryland forward. Senator Mike Lenett (D-19) has announced the endorsements of nearly the entire Democratic leadership team in the State Senate, an apparent effort to rebut challenger Roger Manno's claim that "we need a more collaborative type of leadership in Annapolis." Manno's campaign slogan is "Leadership Takes Teamwork." Following is Lenett's press release. Silver Spring, MD-State Senator Mike Lenett announced the support of his colleagues in Senate leadership for his re-election bid as the State Senator for District 19. Senator Lenett is the Assistant Deputy Majority Whip of the Senate. "I am pleased to have the support of my friends and colleagues in the Senate," Lenett stated. "I am honored that the Democratic Caucus elected me to leadership after only my first year in office. There is no way I could have enjoyed the success I've had so far without their guidance, friendship, and assistance. They know sometimes I need to step out and fight a tough fight for something I believe in, but working collaboratively, very often behind the scenes, we have been able to accomplish so much for Marylanders both in Montgomery County and across the state. I look forward to continuing to work with our leadership team and my other Senate colleagues next session." "Mike Lenett is an articulate advocate for progressive causes, and he picks tough fights on issues he believes in," said Senate President Thomas V. Mike Miller, Jr. "Mike is an effective leader, and residents of District 19 who are concerned about getting things done in Annapolis should stick with him in this election." Senator Rob Garagiola, Deputy Majority Leader and Democratic Caucus Chair, stated: "The reason Mike has been able to pass so many bills, over two dozen in just his first term, is because he knows how to work with his colleagues to get things done. Based on what we observe every day, the Democratic Caucus chose him for leadership after only one year in office. "He'll never win a popularity contest among lobbyists, special interests, or some legislators on the other side of the aisle on issues, but he knows how to be an effective, strong voice for his constituents. No one gave him much of a chance to pass those landmark bills to protect the Chesapeake Bay or the ban on using cell phones while driving that had failed for over a decade, but with persuasion, persistence, and some really tough floor fighting, he prevailed. "Mike is also respected for his courage in taking principled stands, even if it means being the only or first one to speak up. He was one of the first legislators to publicly oppose cuts for developmental disabilities services, a call to which many of us later joined. Before he even took his seat in the Senate, Mike had organized the newly-elected Democratic Senators into a coalition in support of the Health Care For All initiative. Believe me, his constituents don't want to lose that kind of influence or Mike's position in leadership." Senator Rich Madaleno added his support as Montgomery County Senate Delegation Chair: "I sit next to Mike on the Senate floor and have a unique vantage point to observe him in action on a day-to-day basis. He approaches everything he does strictly on the merits, based on whether it is the right thing for his constituents, Montgomery County, and the state. I've gotten to know Mike very well over the years and it is clear that he is a tireless advocate for the residents of his district. He's a strong progressive who cares deeply about social justice, economic opportunity, and equal rights." "A lot of what we do in Annapolis occurs between votes," added Madaleno, "and Mike is a tough and principled fighter who is willing to take the hits and keep on fighting for the causes he believes in. He works hard and effectively both within our delegation to build coalitions to advance Montgomery County goals and with colleagues from around the state to advance progressive goals." Additional Senate and other top government official endorsements will be announced in future releases, including Attorney General Doug Gansler, Comptroller Peter Franchot, and Congresswoman Donna Edwards. Following is the press release from the very busy Ali for Senate campaign. GAITHERSBURG, MD- State Delegate Saqib Ali (D-Gaithersburg) reiterated his willingness to debate incumbent State Senator Nancy King, who he is facing off against in the District 39 Democratic State Senate Primary. Ali first challenged King to debate their respective stances on progressive issues on the popular Maryland political blog Maryland Politics Watch in August, 2009. At the time she said "I just didn't bother answering him because I think it's inappropriate at this time." He reaffirmed his desire to debate King when he announced his candidacy for Maryland State Senate on Kojo Nnamdi’s “Politics Hour” this past Friday. Ali, who lives in Gaithersburg, was elected to the Maryland House of Delegates in 2006 and represents Maryland’s 39th Legislative District (Gaithersburg, Germantown, North Potomac, Montgomery Village, Washington Grove and Derwood). In the private sector, he works as a software engineer. Ali received a Bachelors and Masters Degree from University of Maryland College Park in computer science. Ali and his wife Susan are proud parents of two young daughters Sofia and Sascha. District 18 Delegates Ana Sol Gutierrez and Al Carr have endorsed Delegate Saqib Ali (D-39) for Senate against incumbent Nancy King. Following are their statements. I have known and worked with Saqib Ali now for four years in the Maryland House of Delegates. I admire his intelligence, his independence and his passion for the politics of inclusion. He is willing to take tough stands against powerful interests for immigrants, the poor and underprivileged. His opponent has implied that county residents who need affordable housing, who are poor, need to be perhaps limited in number as a “fair share” of the residents in more upscale neighborhoods (click here). It’s time Montgomery County’s State Senate delegation reflected the diversity in our county. I support Ali for State Senate! I have served for over two years with Saqib Ali on the House Environmental Matters Committee. I know that Saqib is a thoughtful and committed environmentalist. This past session I introduced a bill that would establish a 5¢ fee on all disposable bags at supermarkets (paper & plastic). This is similar to a bill that recently passed in Washington DC. The idea is to encourage people to reuse bags instead of using the disposable bags which end up polluting our environment and especially the Chesapeake Bay. The powerful plastics lobby killed this bill. However Saqib fought with me on this good cause to protect the environment. I support Ali for State Senate! Here are races Six and Five! With Hank Heller’s retirement, the first of what could be as many as three open Delegate seats has emerged. Many of the candidates in the mix have been running for at least a year, with Sam Arora, Bonnie Cullison, Hoan Dang, and Jay Hutchins leading the way. Interestingly, thus far none of the non-incumbent candidates ran in the crowded 2006 race where eight Democrats ran. Tom DeGonia recently announced his intention not to run. It is too early to determine all of the dynamics of this race. Cullison is a shoo-in for the Apple Ballot and has the support of Doug Duncan. Sam Arora’s cash on hand of over $100,000 should frighten his opponents because that translates into a lot of mail and he has already knocked on hundreds of doors. This will be a horserace that is won at the mailbox and door step. With Delegate Roger Manno moving up to challenge Senator Mike Lenett, Ben Kramer is the only incumbent Delegate left. Kramer may just run for County Council. If he stays put, he will almost certainly win re-election. He is a self-funder, has run for office four times and wiped out Nancy Navarro in Leisure World last year. A Manno-Kramer team in District 19 would be troublesome for Lenett. The other candidates have strengths and weaknesses. None of them are well-known in the district. Cullison and probably Hutchins will get the Apple Ballot, but neither reported a lot of money in January. Sam “Hunk of the Hill” Arora has LOADS of money and energy but may not have a lot of institutional support. Hoan Dang has some money but needs to market himself to the entire district. The good news for all of them is that a growing number of open seats creates more opportunity to snag one of them. 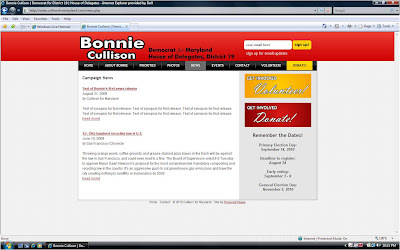 Finally, Cullison’s campaign is memorable for the reason that it has had the worst website rollout in this cycle, bar none. MPW has had an active link to her site for a more than a week and here is what the voters have seen. Delegate Karen Montgomery seems to have adopted the Herman Taylor attitude of move up or move out (the political ladder). She is challenging her district’s senator, Rona Kramer, from the left. Many left leaning interests have shopped for a challenger to Kramer, finally getting one with Montgomery after being turned down by several others and seeing Luedtke withdraw. While Montgomery’s views are distinct from Kramer’s on issues like the death penalty, it remains to be seen how hard Montgomery is ready to run. She had a respectable $58,000 cash on hand in January, but she will need a lot more to keep up with Kramer. This could be a barn burner if Montgomery is willing to put the work in and draw some sharp distinctions from her opponent. Liberals despise Senator Rona Kramer for her labor, environmental and business/regulatory records and have finally found someone to run against her. Montgomery is a credible challenger. She has served in the district just as long as Kramer. She will have plenty of progressive support. And our sources tell us that she has made the rounds of the district more than Kramer and has knocked on more doors than her in the past. But this is Rona Kramer we’re talking about. She is one of the toughest members of a rich and ruthless family that has bullied its way through county politics for decades. Rona will chew on asphalt just to spit out the chunks at her enemies. And she has already previewed her campaign message to the Gazette, which will be, “I was fighting for you during the special session while Karen Montgomery was in China and missed every vote.” You can write this down in blood: Rona Kramer will fight like hell and spend more money than you can imagine to keep her seat. Montgomery and the liberals will have to bring it – HARD – if they want to have a chance at beating her. We’ll have races Four and Three tomorrow. Following is a press release from GreenWheaton. Wheaton, MD April 27, 2010 – On Sunday, May 2, 2010, GreenWheaton, an affiliate of the Mid-County Regional Services Center, will be installing a conservation landscape opposite the Center’s offices at 2424 Reedie Drive. The conservation landscape will be installed in a 500 square foot section located in the southwest corner of the Wheaton Green Triangle. Interested Montgomery County residents are welcome to attend and learn about the benefits of removing turf and creating conservation landscapes in our environment, which soak up more rain water than typical lawns or gardens. Sponsors of this conservation landscape installation include Montgomery County Department of Environmental Protection, Maryland-National Capital Park and Planning Commission, Friends of Sligo Creek, Neighbors of Northwest Branch, Anacostia Watershed Citizens Advisory Committee, and Speedy Signs. The GreenWheaton Sustainable Initiatives Workgroup is a joint sub-committee of the Wheaton Redevelopment Advisory Committee (WRAC) and the Wheaton Urban District Advisory Committee (WUDAC) dedicated to applying environmentally-friendly building and planning techniques to the Wheaton Maryland downtown and surrounding neighborhoods. Council District 1 candidate Ilaya Hopkins sent the following email to her supporters last night explaining her previous history as an unaffiliated voter and urging them to vote in MPW's poll on her race. Hopkins's email was remarkably effective in moving our poll from an early 80% advantage for Roger Berliner to more than 50% supporting the challenger before Berliner recovered. Now they're running neck and neck, which is really good for Hopkins. 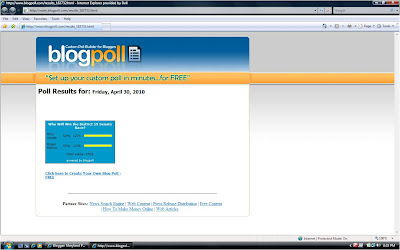 Hopkins was not the only candidate to take an interest in the poll, which accounted for its movement. Partially as a result of all of this attention, yesterday was the fourth most-visited day in the history of the blog. (Yes, it beat out the British Lucky Paul posts, but not the MACO drunks.) Thank you! Prior to Delegate Roger Manno's announcement for District 19 Senate, we learned that incumbent Senator Mike Lenett's campaign has taken a number of steps to prepare for the anticipated challenge. Specifically, we hear that Lenett is hiring Zack Gallant, a former field operative for Barack Obama, U.S. Senator Ben Cardin, the Maryland Democratic Party and Michael Sarbanes's campaign for Baltimore City Council President as his campaign manager. Lenett has also hired David Goodman's TruBlu Politics for media and Bernie Horn for consulting and research. Lenett has a new website, is interviewing for two Field Director positions and is in the process of hiring a fundraising firm and a polling firm. 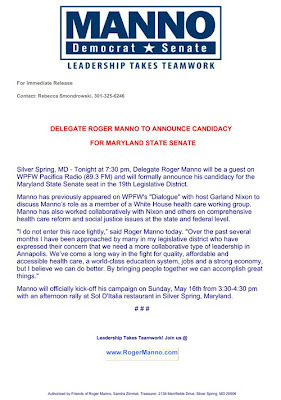 Manno's potential Senate run has been one of the most worst-kept "secrets" in Annapolis, right alongside Saqib Ali's "surprise" challenge in District 39. (Quite a few spies were laughing about the allegedly unexpected nature of Ali's "surprise.") Lenett has been getting ready for Manno since at least last fall. In a letter to the County Council last week, MCGEO President Gino Renne sharply criticized County Executive Ike Leggett for failing to abide by language he negotiated with the union calling for a "formal partnership" and "a cost efficiency study group to conduct a top-to-bottom analysis of the County’s management and operational practices." Renne asks the County Council to "step into the leadership void that the Executive Branch has created" and consider "alternatives to the punitive and lopsided recommendations that have been advanced by the County Executive." Following is the complete letter dated April 16 and posted on MCGEO's website on April 19. When I testified before you on April 6th I said the members of our union have only one expectation: “your work product must be fair and balanced.” Make no mistake, the final budget that you authorize for the coming year will be your product and the voters will judge you—and the County Executive—by the outcome. All of you espouse the core principles that are the bulwark of the Democratic Party—principles which I personally share. Among those principles is an abiding faith in effective government that serves constituents and values fairness and equality. There has never been a time when those principles were more important to the future of our County and its citizens. It’s easy to lead when the goals are clear and resources are at hand. But the true test of leadership is how we respond in the toughest of times. I am asking you to step into the leadership void that the Executive Branch has created. My Union’s members, my Executive Board and I all understand that we will not get through this crisis without some pain and we are prepared to accept our fair share—but only our fair share. One of the key principles that drives our Union is the acceptance of our responsibility within the context of our collective bargaining agreement and our employment obligations. Our end of the deal is that each member gives our best effort to the job to maintain the quality of services that residents demand and expect. In return, our members expect competitive wages, safe and decent working conditions and a meaningful voice on the job. I have criticized the Executive extensively for his obvious lack of vision in proposing a budget plan that—for the third consecutive budget cycle—cuts vital services to the County’s most vulnerable citizens and imposes the heaviest burden of sacrifice on the members of our union. This year, the Executive has gone beyond previous years, putting a disproportionate amount of the load on the shoulders of front-line county government workers and the county’s most vulnerable citizens—while barely touching management layers and failing to ask for similar sacrifices from two-thirds of the County’s workforce. Our Union’s disappointment with the Executive extends beyond the budget document. The recent history of collective bargaining with the County Executive reflects a serious deterioration of the relationship. For example, there is concrete language within our existing collective bargaining agreement that establishes a formal partnership between the County and the Union. Unfortunately, the Executive has totally repudiated the letter and the spirit of that provision. Because the County Council is also a de facto partner by virtue of that agreement, we call on you to be cognizant of that partnership and approach this budget review with the explicit obligations of that partnership in mind. Last fall, when the Union and the County Executive concluded an interim agreement to help deal with the growing fiscal crisis, the final document also included a provision to establish, fund and participate in a cost efficiency study group to conduct a top-to-bottom analysis of the County’s management and operational practices. That action has not been taken. I call on the Council to act to fulfill this contractual obligation as an integral element in fixing the failures of this budget and to effectively deal with the challenges that we all know are on the horizon. For better or worse, now, the responsibility falls to you and your colleagues on the Council to do the right thing. Make no mistake, voters are watching and their expectations are reasonable. They expect nothing less than responsible leadership. Each Council member sits on a committee to oversee various County administrative agencies. You have the authority and the responsibility to exercise that oversight in the interest of County residents. I am asking you directly to make certain that the agency officials who appear before you in the coming weeks provide candid and comprehensive information about the genuine budget alternatives that exist. You should ask for explanations as to why their reduction-in-force plans leave managerial levels virtually untouched, and they must respond. You must hold the County’s bureaucrats accountable because voters will ultimately hold you accountable, and because it is the right thing to do. 1. Exercise your oversight responsibility to prod agency heads and department directors to examine alternatives to the punitive and lopsided recommendations that have been advanced by the County Executive. 2. Direct the Executive to observe the letter and the spirit of the collective bargaining agreement between the County and UFCW Local 1994, especially as it pertains to partnership and the establishment of a cost efficiency study committee. 3. Work with us to re-craft this budget document to make it fair and balanced in the interest of the welfare of our County’s residents, its employees and the county itself. On behalf of the members of UFCW Local 1994, I thank you for your concern and I urge you to continue to exercise independent leadership and judgment. The incumbents in District 14 do not lack for ambition as demonstrated by Herman Taylor’s quixotic run for Congress and Karen Montgomery’s decision to take on Rona Kramer (more on that later). Their decisions create two open seats. Craig Zucker appears to be close to a sure thing for one of them. He has been running for eight years, has raised lots of money, and appears to have broad support. A second opening upsets his apple cart because folks who ruled out fighting him for one open seat are taking a second look. The most public candidate thus far is teacher, occasional MPW guest blogger, and activist Eric Luedtke. We last saw Luedtke at the end of 2009 when he pulled the plug on a challenge to Kramer before it really started. What made him an attractive candidate then still holds true and he has the benefit of not challenging a self financing incumbent. Others will likely get into the race. As I have written before, the desire for a candidate that brings more diversity to District 14 is strong. Full disclosure, I donated to Eric Luedtke. Two open seats and two credible candidates. Yawn… I have nothing more to say about Craig “Lock” Zucker since he reported more than $50,000 in the bank before even formally starting his campaign. MCEA Board Member Luedtke will work hard and get lots of progressive backing for the other seat. Even though this district has the largest concentration of African Americans in the county along the US-29 corridor, I am hearing nothing to indicate that any candidate of color is getting in yet. Can someone wake me up if there’s another credible candidate of any kind? The only interesting thing about this Delegate race is how it will interplay with the Senate race. I could see Zucker and Delegate Anne Kaiser supporting incumbent Rona Kramer and Luedtke supporting challenger Karen Montgomery. Or maybe not. Come on, people, give us something spicy to write about! Don’t make Saqib Ali do all the work! Bill Bronrott’s resignation creates the fifth legislative vacancy in Montgomery County during this term. All indications are that the Central Committee will appoint a caretaker (that is certainly how my vote will be cast) and will let candidates for a four year term run without an incumbent in the fall. It looks like two of the bigger name candidates, Reggie Oldak and Don Mooers, are taking a pass. But lots of hats are already in the ring including 2006 District 18 candidate Dan Farrington, Montgomery County Young Democrats president Scott Goldberg, Obama campaign guru Kyle Lierman, and possibly many others including Lise Van Susteren. Another wrinkle in District 16 is that Bill Frick faces the same problem as Kirill Reznik in District 39: he will be before the voters for the first time. Frick has had strong fundraising and worked the district hard over the past three years, but he will have to work much harder than had all three incumbents run together. Full disclosure, I am a Montgomery County Democratic Central Committeemember from District 16, cast a vote to appoint Bill Frick in 2007, and have donated to him. Oldak’s decision not to get in deprives this contest of a top-tier challenger with a record of getting D16 votes. She received the Post endorsement last time and almost knocked off long-time incumbent Marilyn Goldwater, whose retirement created the opening for Frick. Now we have to look at everyone else. The early favorite is Dan Farrington, who ran a great race in District 18 in 2006. Farrington received the Post and Gazette endorsements but lost narrowly to Jeff Waldstreicher, who had the Apple Ballot, for the open Delegate seat. The two were the hardest-working candidates in a good field and Farrington raised FAR more non-self-financed money than anyone else. I found Farrington to be so impressive that I sent him a $100 check immediately after seeing him at a campaign coffee that year. One problem he has is his opposition to the Purple Line’s proposed rail alignment, a position that helped him finish second in the Chevy Chase precincts but will not be so helpful in Bethesda. Still, if Farrington goes into high gear, the other candidates will have to bust their behinds to keep up. As for the incumbents, Bill “Stud of the Statehouse” Frick will finish first and Susan Lee will finish second. Don’t prove me wrong, Bill! We’ll have races Six and Five tomorrow. Following is a statement by County Executive Ike Leggett on Northrop Grumman's decision to locate its headquarters in Virginia instead of in Maryland. I am disappointed that Northrop Grumman, one of the world's leading technology and security companies, did not choose to relocate its headquarters to Montgomery County. Montgomery County, led by our Department of Economic Development, worked closely with Governor O'Malley's office, the Maryland Department of Business and Economic Development, and our commercial real estate sector to attract Northrop Grumman and help them realize that a Montgomery County location was indeed the best East Coast location for them to grow and prosper. Unfortunately, we were not successful, but Montgomery County remains the economic engine of Maryland and a leading contributor to the region's economic vitality. We remain steadfast in our resolve to support and grow our nearly 3,000 IT/telecom companies and nearly 300 biotech companies and will continue to market and position Montgomery County as a location of choice for new and expanding companies. Recent initiatives like the County's decision to move ahead with The Great Seneca Science Corridor Plan and recent passage of a local biotech investment tax credit are just some of the innovative, progressive steps the County is pursuing to remain a regional economic driver now and into the future. Adam, I have formed a Rice for County Council exploratory committee that is comprised of leaders from the business, religious, education, labor, public safety and non-profit sectors. We will take into account all of the factors surrounding a bid for the seat in District 2. The Washington Business Journal has the scoop. Now that the General Session is over, the politicians are getting into high gear for the election. And so is MPW! Once again, Marc and Adam are going to dissect the ten top primaries in MoCo. (You can see our prior assessments from September and December here.) Let the fun begin! District 18 Challengers - There are two challengers running for Delegate in District 18 (Vanessa Atterbeary, and Dana Beyer). They are challenging a unified slate with a tough-as-nails Treasurer. Congressional 4 - Donna Edwards dodged her toughest primary foe when Glenn Ivey declined to run. District 14 Delegate Herman Taylor is poised to announce, but it would take a minor miracle for him to make a dent. Council 2 - Sharon Dooley has already entered the race. The big mystery is who she will be running against. Until incumbent Mike Knapp makes a decision about whether to run or retire, this race is largely unformed. Craig Rice’s potential candidacy would make for an exciting race but he would need to catch up on local issues and prepare to mount a more aggressive primary campaign than he would need in District 15. Ilaya Hopkins has been making the rounds and raising money in her bid to unseat first district Councilman Roger Berliner. 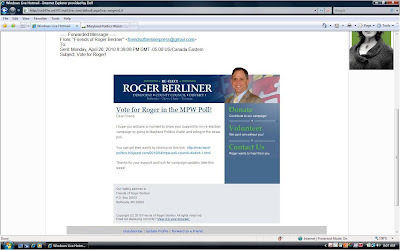 Hopkins does have a shot at the Apple Ballot, which endorsed Berliner’s Republican opponent in 2006. Berliner’s biggest headlines this year were also somewhat embarrassing, as five votes on the Council passed him over for President. Hopkins would be an extremely competitive candidate in an open seat race given her personality and civic experience. But challenging an incumbent is a very different scenario. Berliner will likely have far superior resources, name ID, and a record of accomplishment to run on that includes aggressive environmental positions like his recent carbon tax proposal. The Council’s unanimous votes for the White Flint sector plan and Purple Line also help inoculate Berliner from criticism on those major issues, which small parts of his constituency could be angry about. Finally, Hopkins does not have a long history as a Democrat to rely on in a party primary the way Berliner does. 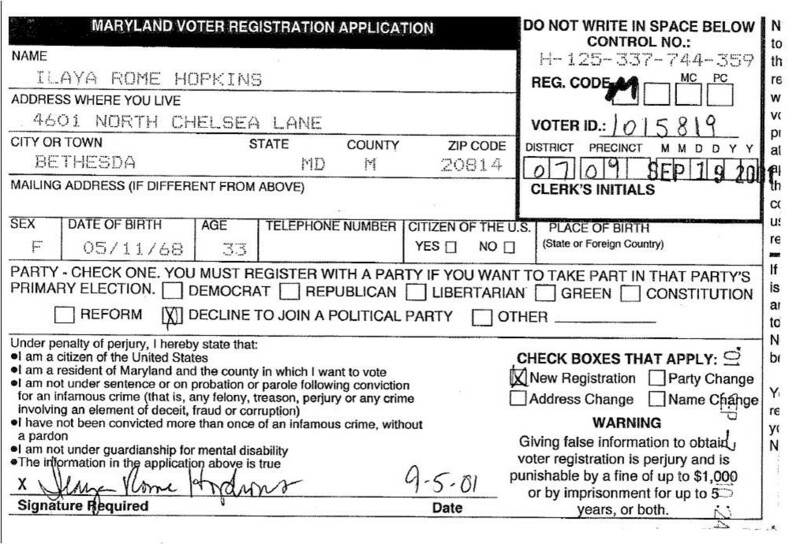 Hopkins is a relatively new and welcome addition to the Democratic fold. On the other hand, Berliner has spent his entire career as a Democrat, including tours on Capitol Hill with liberal stalwarts such as Senator Howard Metzenbaum (OH) and Congressman Henry Waxman (CA). That history can make a difference in party primaries. 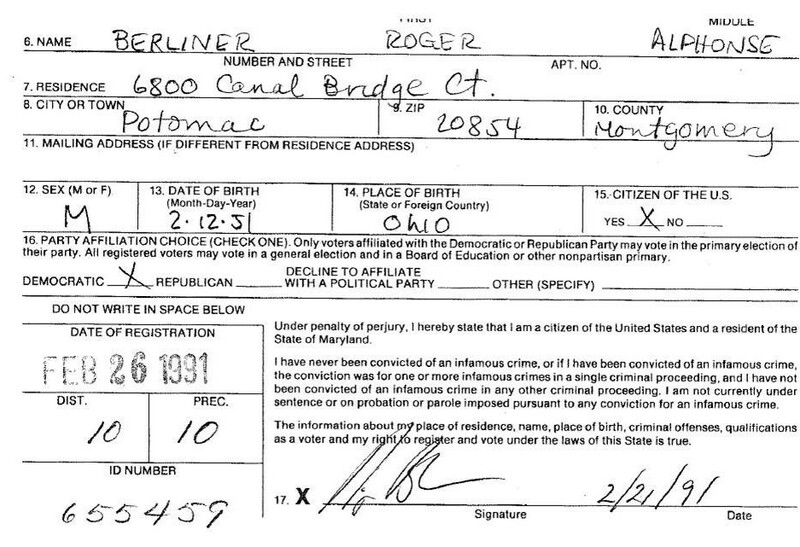 Berliner is a Democrat who runs with a big “D” on his chest and that makes Hopkins’s registration history relevant. Hopkins bought her current residence along with her husband on 2/19/98. She filled out a voter registration card as an unaffiliated voter on 9/5/01 and was formally registered with the county on 9/19/01. That means she did not vote in Maryland in the 1998 and 2000 elections. 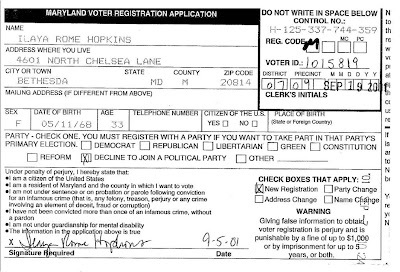 Hopkins voted in the 2002, 2004 and 2006 general elections. On 9/4/07, she changed her registration to Democrat and voted in the 2008 primary and 2008 general. 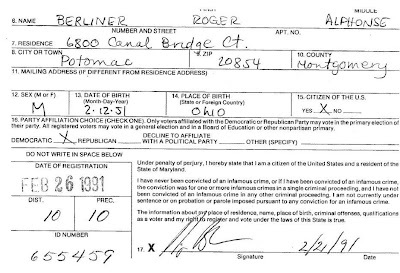 Berliner registered as a Democrat in the county in 1991 and has been a consistent voter since then. 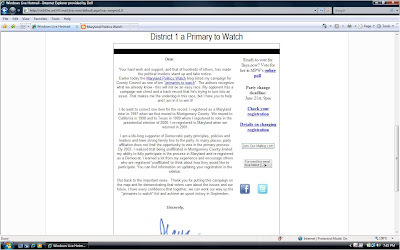 We show both candidates’ initial voter registration applications below. 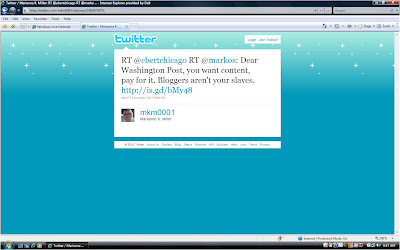 Hopkins has been running an able campaign against Berliner. She has a campaign manager (even if he was caught spying by the enemy), holds regular events, releases videos and has a nice first literature piece. She has a chance to pick up some union support. But Berliner started the year with almost $100,000 in the bank before Hopkins had a campaign account and it’s unclear if she has closed that gap. Even if Hopkins gets the Apple Ballot, Berliner’s occasional conflicts with the unions will probably earn him the Post endorsement. That means Berliner may have to commit a mistake of some kind for Hopkins to win. Judging by last year’s Council President fiasco, that possibility cannot be ruled out. Montgomery Village Board of Directions Foundation President Bob Hydorn started running for Delegate even before an open seat emerged. His official announcement is on May 1st. This could be a problem for Delegate Kirill Reznik, who will be before the voters for the first time. At a minimum, almost 8,000 of the 29,000 registered Democrats in District 39 reside in Hydorn’s base of Montgomery Village. One District 39 activist told me that over 25% of the so-called “super Dems” in the District are in Montgomery Village. It is an active and organized area that Hydorn has worked before. That said, Reznik has been in office for three years and has spent that time wisely talking to individuals and groups throughout his district, advocating good legislation, and preparing for his first election. Since a seat has now opened, a few other candidates could also enter the race. Adam has spent a lot of time talking about Shirley Rivadeneira. She would be a great candidate, but there is no chance she will run. She just resigned from the Central Committee for a White House job. Full disclosure, I am Kirill Reznik’s campaign chair. Hydorn was first out of the blocks. He has an organization and a big geographic base in the district. 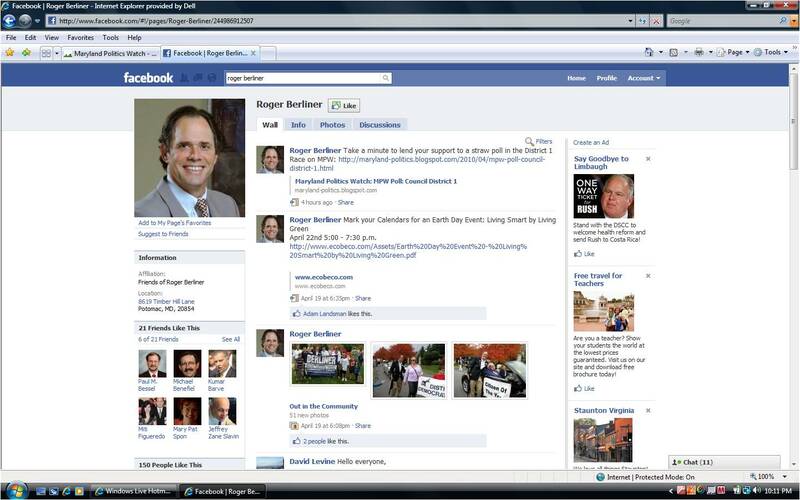 He is also a former Republican who has Republicans as his Treasurer and campaign manager. That creates an opening for other Democrats to get in. Two possibilities are party activist Francine Towbridge-Winston (who is receiving an award at the party’s spring ball) and MCPS administrator Juan Cardenas, who applied for the 2007 Delegate appointment ultimately won by Kirill Reznik. 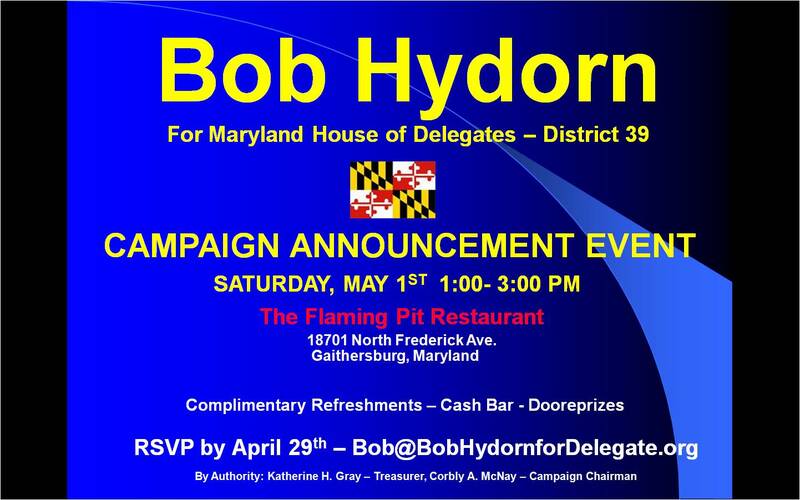 It is getting late to start a campaign from scratch and that gives Hydorn an advantage. Surprisingly, I am more bullish on Reznik than his own campaign chair. Like the other appointees, Reznik is highly motivated to win an election in his own right. An open seat will just encourage him to work harder. That’s a mini-problem for Senate challenger Saqib Ali since more joint literature featuring incumbent Nancy King will be passed out on the doors. Delegate Charles Barkley has annoyed the House leadership but that won’t hurt him back home. In fact, if it matters at all, it may actually help! We’ll have races Eight and Seven tomorrow.